One of the foundational elements of our work as a community has been our success in collaboration. Nowhere has this success been more evident than in our developing a list of common needs for our community. In late 2013, 17 health care organizations (hospitals, clinics health depts) and 22 community organizations (nonprofits, faith orgs, and govt agencies) launched an effort to identify the top health needs in the five county Mid-Columbia region. The effort utilized mail, phone and written surveys, and group and individual interviews, in English and Spanish. In the end, almost 40 organizations gathered information from more than 1,100 community members. The result is the first collaborative, comprehensive Health needs assessment for the entire Gorge region. The community is currently processing survey results for the 2017-2020 Health Assessment with the CHIP to follow after the first of the year. In May 2014, the community took the next step and prioritized these needs and developed a process to address them in the Community Health Improvement Process (CHIP). The CHIP was created by the Community Advisory Council (CAC), a local committee made up of community members, the majority of whom are Medicaid consumers. The CAC members analyzed, reviewed, and discussed the most pressing needs they face every day. The CHIP divided the health needs into three categories: 1) Social Determinants of Health, 2) Direct Healthcare Services, and 3) Health and Healthcare Ecosystem. Significantly, the Needs Assessment and the CHIP have been accepted as the needs assessments in the region. 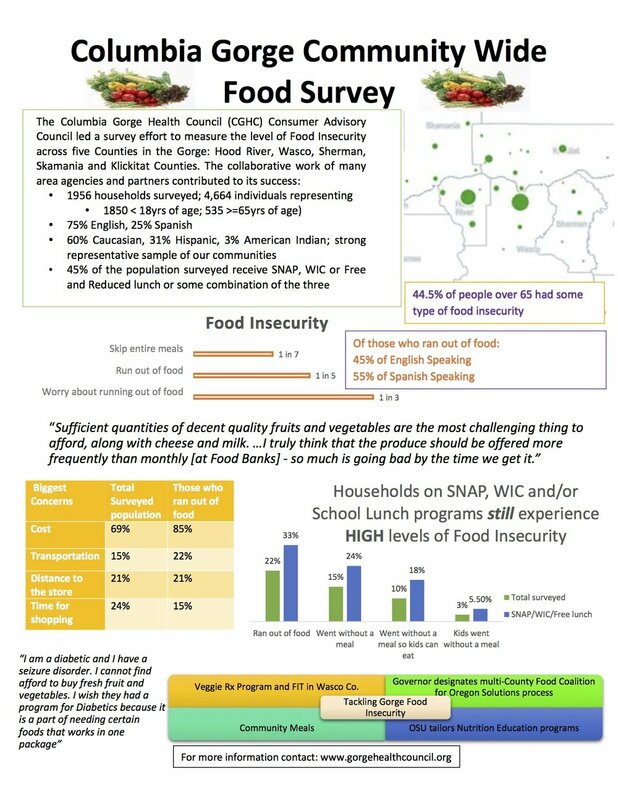 Seeking to dig deeper into food insecurity in the region, the Columbia Gorge Health Council and One Community Health, (the region’s federally qualified health centers migrant health clinic) conducted a survey in 2015 specific to food insecurity. With more than 2,000 responses from throughout the region, this survey demonstrated that 1 in 3 residents worry about running out of food, and 1 in 5 miss meals. In a region that has relied on the agriculture industry for more than 125 years, this level of hunger is simply unacceptable.